Today, one of Flashback Summer's sponsors is here to share her insight on working with vintage patterns and taking care of them, along with offering 3 digital patterns to a lucky winner! (Those details are at the bottom!) 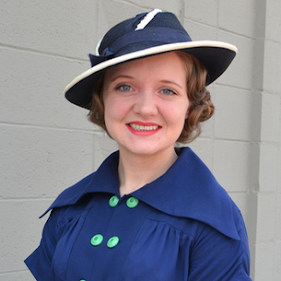 This expert is Anna Depew of Mrs. Depew's Vintage Patterns shop! I love her shop. 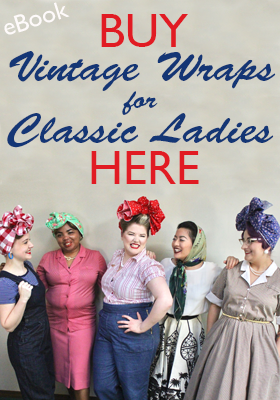 She has an array of notions, books, magazines, and digital patterns that can help you create period-accurate, unique vintage for any decade from the 1910s-60s and later. I myself have used one of her digital patterns and am in the process of creating clothing from another. I appreciate the affordability, as they make rarer patterns accessible at a lower price point! 1. First things first, when you get that baby home, inventory the pieces! It's a horrible feeling to bring home a treasured pattern, buy fabric, and lay out the pieces, only to realize you're missing a critical piece! 2. Make a copy! The pattern tissue is likely to be fragile and pinning to to fabric isn't so good for it. I trace a copy of every vintage pattern I'm getting ready to sew. There will always be fitting to do anyway, and it's much easier to make changes to a copy. Also, you might have paid a pretty penny for that pattern, and you'll want to protect and preserve your investment! 3. The same goes for the instructions: make a photo copy and then you can scribble notes, pin fabric samples to it, spill coffee on it, etc. and you won't risk the original. 5. Most importantly, make a test version! I have sewn a lot of vintage patterns and there is always something that needs a little changing. Sometimes a seam doesn't match that well (believe it or not, the big pattern companies didn't always test their patterns, especially during WWII! ), or maybe you need to make a fit adjustment... a test version is a MUST! THIS GIVEAWAY IS NOW CLOSED. THE WINNER WAS ANNOUNCED HERE. 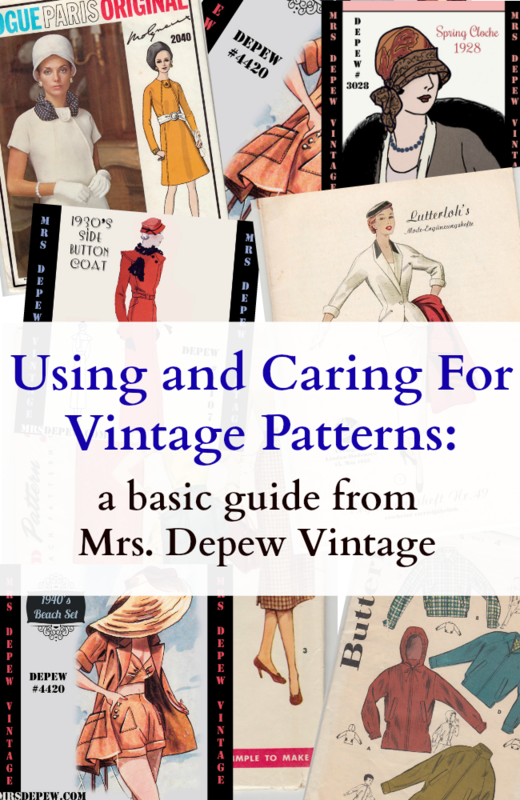 As I stated above, this is a giveaway for three digital patterns of your choice from Mrs. Depew Vintage Etsy Shop. This giveaway begins today and ends on November 30 at 12 am, U.S. Central Standard Time. 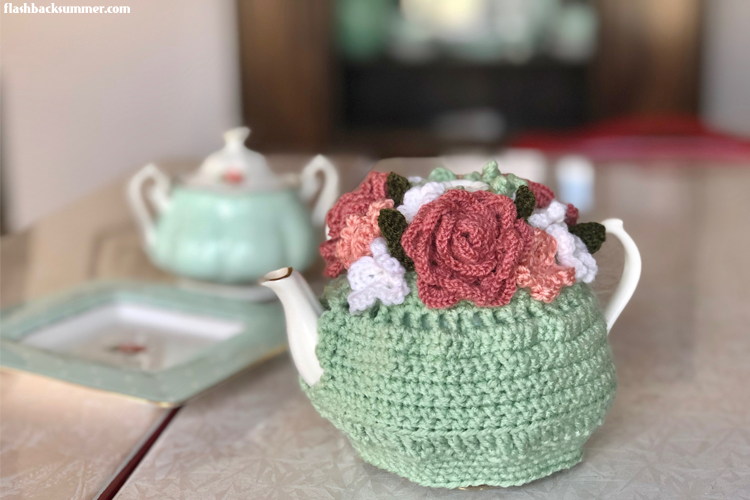 You can earn entries by liking the Mrs. Depew Vintage Facebook page, commenting with your favorite pattern, and subscribing to Flashback Summer Emails! There's no way I can pick just one favorite pattern :) but I do love her vintage bra patterns. I think right now, because my daughter is especially enamored of Miss Fisher's Murder Mysteries, and has asked me to make her something lovely like Phryne would wear, I would have to pick one of the 1920s dress patterns. I'm having a hard time narrowing it down to just one of them, though! There are so many beautiful patterns to choose from, but I'd definitely choose one of the bra and tap pants patterns! I would chose the 1940's pajama set for sure! I love all the 1950's patterns. I'm thinking about the 1950's beach set. Oh man, it was hard to choose, but I like this https://www.etsy.com/listing/80314406/vintage-sewing-pattern-1940s-ladies-pin?ref=shop_home_active_12 something cute for summer! So many lovely patterns! I've had my eye on quite a few for *quite* some time, but this 1940s dress (https://www.etsy.com/listing/190890888/vintage-sewing-pattern-1940s-dress-in?ref=shop_home_active_2) is positively dreamy! Definitely one of my favorites. I have had several of her patterns in my todo list for a while. I'd love to make the beach bustier. I know it's the wrong season, but I love it. Thank you for a great giveaway! Love Mrs. Depew and her patterns! I'm really digging Depew 6136! Love the wrap dress look. I've always wanted to try one of her bra patterns or a swimsuit pattern like 1001 or 1002 or maybe a dress pattern, like 4421 or 3015 or 3005. Or maybe about fifteen other patterns. Mrs. Depew has so many fantastic ones! I would want to try the 1930s Day Dress (A-1041) or any of the 30s patterns really. I love the style but it is hard to find nice but not expensive pieces since they are getting closer and closer to being considered antiques. I love Mrs. Depew's shop! She has so many fabulous patterns. I would definitely choose one of the 1930s patterns or one her lingerie patterns. Lots of gorgeous patterns, think I would choose a bra one or the circle skirt. Oh, I love Mrs. Depew's patterns! I've used one of hers to do a bodice for a playsuit, and although I definitely need to refine my pattern skills a bit I'd love to try one of the draft-your-own patterns. I could really use a pair of cigarette pants or a nice 40s style dress, but the pattern that caught my eye first was Depew 4546 for that AMAZING 1940s coat. I want to make one! Mrs. Depew's patterns are amazing. There is such a great selection, it's so hard to choose. Since I'll be needing a 20's style dress for February, I think I would be really interested in the 1920's Flapper Easy Draped Dress, Depew 3022. There were too many to pick from, how could I choose? But I really like the look of "Vintage Sewing Pattern 1940's Peplum Jacket". The shape of the peplum is gorgeous, and I am intrigued by the ruler drafting system. What a lovely giveaway! I have always been drawn to drop waisted dresses from the 1920s so is probably go with a pattern from that era! Thank you for the giveaway Emileigh! I'd love one of the nightgown or pj patterns. Wow, so hard to pick! I did like the Vintage Sewing Pattern Ladies 1950's Halter Top Blouse pattern!